To enter South Korea, a passport valid for a minimum of three months is required by all nationals referred to in the chart above. • Nationals of Australia, the USA and EU countries can stay visa-free in South Korea for up to 90 days, except nationals of Portugal who may stay for up to 60 days and nationals of Cyprus who may stay for up to 30 days. • Nationals of Canada can stay for up to six months. Nationals not referred to in the chart are advised to contact the embassy to check visa requirements for South Korea. All foreign visitors to South Korea are biometrically registered, and are required to have fingerprint samples and a digital photograph taken by an inspector upon entry. Children under 17 and officials of international governmental organisations are exempt from this requirement. Validity usually begins from the date of issue. 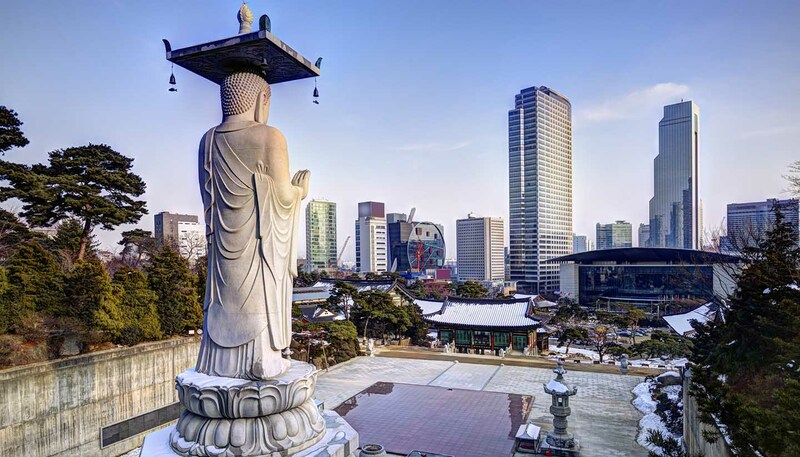 Some nationals who would normally require a visa may enter South Korea without a visa provided they are in transit to a third country, remain in the Seoul area, and leave South Korea within 24 hours; check with the embassy for eligibility. Allow five days for visa processing. Telephone: +1 202 939 5600 (consular section). Telephone: +44 207 227 5500.